Are you scared of meeting your online date for the first time? Here are some tips to help you feel relaxed and ready. Online dating at any age is a tough prospect. When you’re a senior, chances are you’ve come out of a long-term relationship and just aren’t used to meeting people to date. Maybe you had a tough divorce or your spouse passed away. You didn’t have to think about a new romantic partner in your life, but now you are considering the idea. You’re in good company. 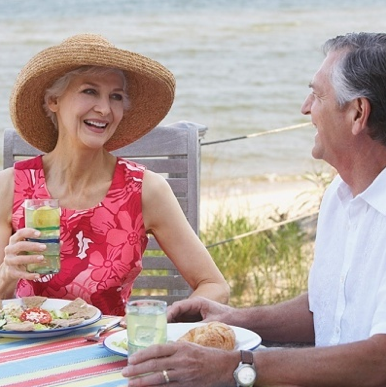 Seniors are the fastest-growing segment of the online dating population. If you think all those other single seniors know what they’re doing but you don’t, think again. Everyone is figuring it out as they go along. The trick is finding what works for you. Pick an activity as a first date. Instead of feeling anxious about sitting across the table from each other and making conversation, sometimes it helps to break the ice to have a more active date. Try taking your dogs for a walk in the dog park, and then stop somewhere for lunch or coffee. Since it’s summer, you might try something relaxing like kayaking, or a wine tasting. There are no wrong answers here. Do what makes you feel comfortable, and something that gives you pleasure, so you’re not so worried about the date itself. Dress comfortably and confidently. You might feel pressured to put on your three inch heels and squeeze into your spanx, but don’t do this for your date’s sake. It’s important to feel comfortable on a date, and that includes your clothing. If heels aren’t your thing, wear some sparkly flats. If your favorite purple wrap brings out your eyes, then by all means put it on! If you feel good about how you look it will come across as confidence to your date. We could all use that! Enlist a friend’s support. Sometimes it helps to have your friend come over before the date to help you get ready. Even a phone call can help ease your nerves. Invite your friends to support you in your dating adventures. Also, it’s a good idea to let them know where you’re going and who you’re with so they can keep an eye (or ear) out for you. Practice makes perfect. Maybe on your first date you’re all thumbs, or maybe you talk a little too much and regret oversharing later. Don’t worry. Not every date is going to be fabulous, and you won’t always be perfect. The point is, you’re out there making the effort. You’re putting one foot in front of the other. So take it easy on yourself.